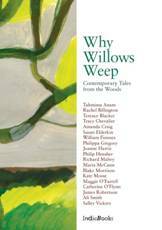 Today we’re starting on pre-publicity for our next title – Why Willows Weep. It’s a collection of fables or stories by leading writers, each one inspired by a different tree. The collection has been edited by Tracy Chevalier and will raise money for the Woodland Trust, the UK’s leading woodland conservation charity. Publication date is 19 October.